McVicar's Hall. SE corner 2nd & J. Roller skating rink by day, Moving Picture House by night. 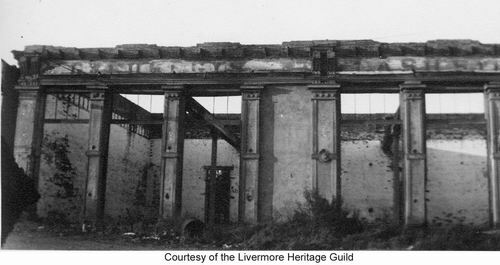 Burned August 24, 1919 along with the Livermore French Steam Laundry next door. Note says "Where Montgomery Wards is 'now'" (1968). The entrance is on J St.
Sign: "Bell Theatre. Moving Pictures. Continuous performance. Admission: Adults 10 cents, children 5 cents. Matinees"
The boxes around the trees were there to keep the stock from gnawing on the bark. Sign reads: "Geo. Beck Sons Groceries" "Bakery?" 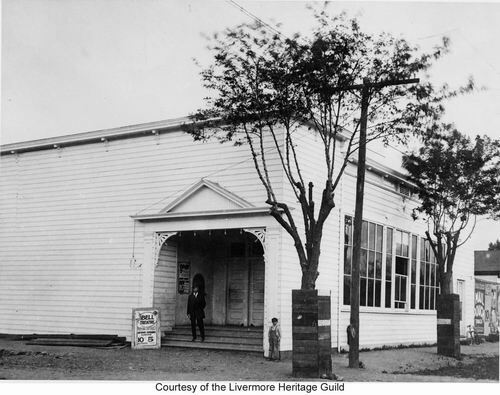 1896 photo from the McLeod building looking North on Livermore Ave. Farmer's Union building on left at NW corner of Livermore and Railroad. 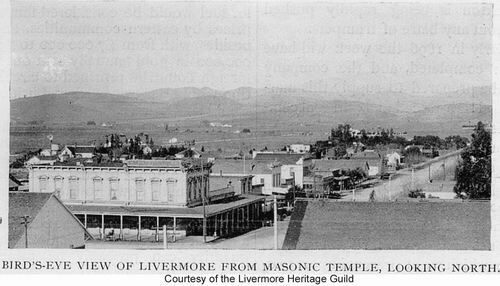 The buildings in the foreground on the left and right are labeled "Livermore Warehouse Co. Warehouses" on the 1889 poster. The V&G Muffler buildings occupy the spot on the left, with a tune up shop on the right. 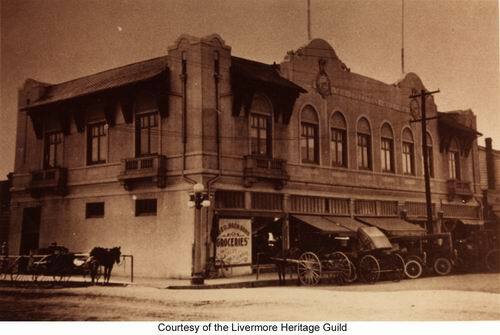 The building on the northern end of the block that the Farmer's Union is on (at Oak Street - now the RR tracks) is labeled "Gardemeyer Block" The two story to its left, with 3 upstairs windows was the Crest Hotel. The two story building with 2 upstairs windows next to the Farmer's Union is the only one still standing today. 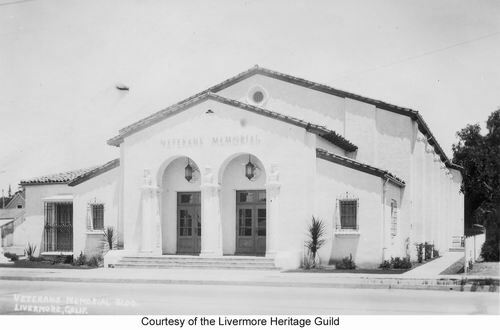 Veterans Memorial building in 1932. On the south east corner of 4th & L.